Kyle and Chris are the founders of Huntress Labs (@HuntressLabs on Twitter) and have their own blog and podcasts. To see more from them, check out our blog, and Cybrary’s exclusive interview with Kyle. This brief session covers malware persistence – why it’s important, what to do about it, how it’s done, why attackers use it, and most importantly how to remediate it. Malware persistence is when a computer gets infected by a virus that allows the malware to boot up when a computer restarts or a user logs in to a system. 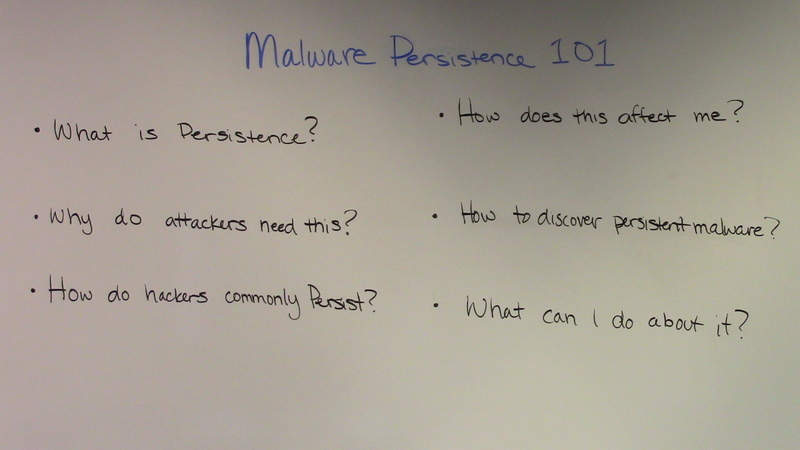 How do you discover Malware Persistence? Use free tools like Autorun which are part of the Microsoft Sysinternals tool suite, or other tools available for download. Autorun is the defacto tool that enumerates anything and everything that’s likely to start up. Other sysinternal tools such as ProMon (Process Monitor) allow users to get more granular and help figure out what is happening in the boot process when a malicious payload or application starts.